It has been the week of gift-giving for The Dog Liberator. I want to thank all of you. I sit here at my desk pounding away all day long, and many times I really do feel alone. But the Fedex and UPS trucks have been rolling in with wonderful surprises, and the emails of donations have been received. I’d like to thank all of you. But today, I found something in the mail that caught me by surprise…. it left a lump in my throat, and I shed a tear or two, realizing how blessed all of us really are. We rescue great dogs, we adopt out great dogs, and we have fantastic supporters. One of which is Sophie Litzenberg. Sophie adopted Murphy in May of 2010. Back then, he was just a black dot! We adopted Murphy in June, 2010 through your organization. That was the best thing that has ever happened to me. He’s the best puppy ever and we love him so much. He is so friendly to people and other dogs. He is so funny because he wants to be human. He knows a ton of tricks and he is well behaved (when he has to be). 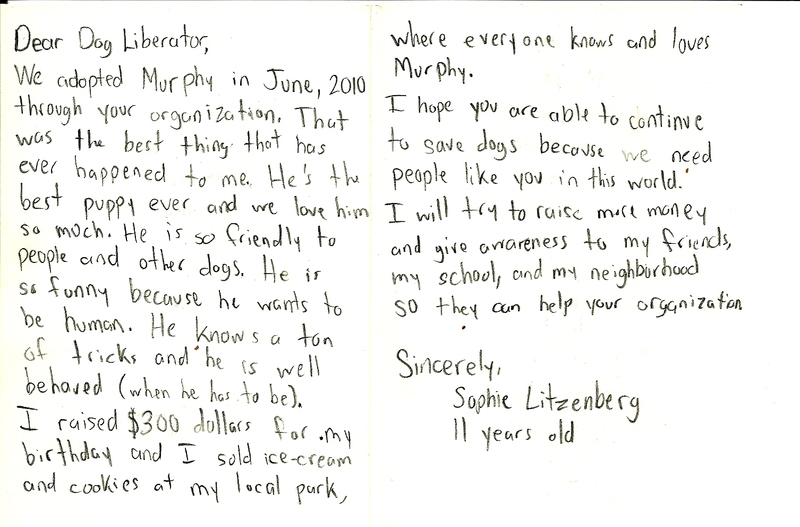 I raised $300 dollars for my birthday and I sold ice-cream and cookies at my local park, where everyone knows and loves Murphy. I hope you are able to continue to save dogs because we need people like you in the world. I will try to raise more money and give awareness to my friends, my school, and my neighborhood so they can help your organization. Inside the envelope was a $300 check. I called Sophie’s Mom, Anne right away, and she explained that Sophie has been saving since last October. 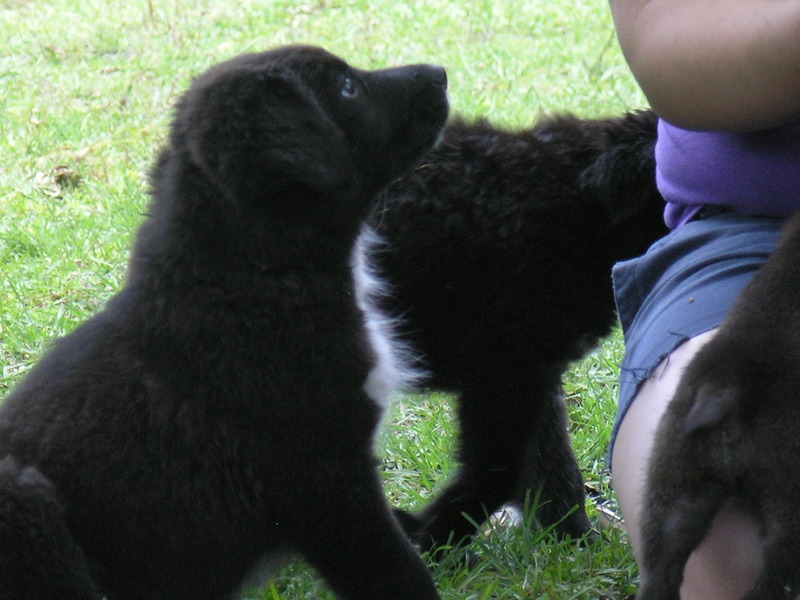 The Litzenberg’s had originally adopted a pup from a shelter, but shortly thereafter, the pup passed away from Parvo. I’ve heard many stories from adopters who suffered the loss of pup from Parvo and the loss of a dog from Heartworm, after they had just adopted. It’s devastating. Sophie, I will accept your donation, but what I’d really like is in the future, you save your hard earned money and put it away for a day that might choose to be a Liberator. Maybe you’ll be a vet, a groomer, a trainer, or maybe you’ll be just like your Mom, and have really smart and loving kids… and you’ll get them a great dog, and teach them how to love and take good care of animals. Sophie, when I get old and can’t take care of the dogs anymore, I really hope that I can find smart and kind children like you who are all grown up, that want to help the dogs. I’m really proud of you Sophie, and I know everyone at TDL is too! I hope all of our supporters will read this and send you a comment! Way to go Sophie! You Rock! You are an amazing young lady, Sophie! What a great thing to do and gives me hope for the future. Sophie ~ What a selfless act of kindness!! I can see that you will be a great ‘Dog Liberator’ when you get older!!! Dogs are trusting and they need people like all of us to protect them! You’re leaps and bounds ahead of your age (and probably my age as well). Simply amazing! I wish that more of us shared your selflessness and compassion. In a time when most of us are desperately holding on to what we have, you gave so much to others. 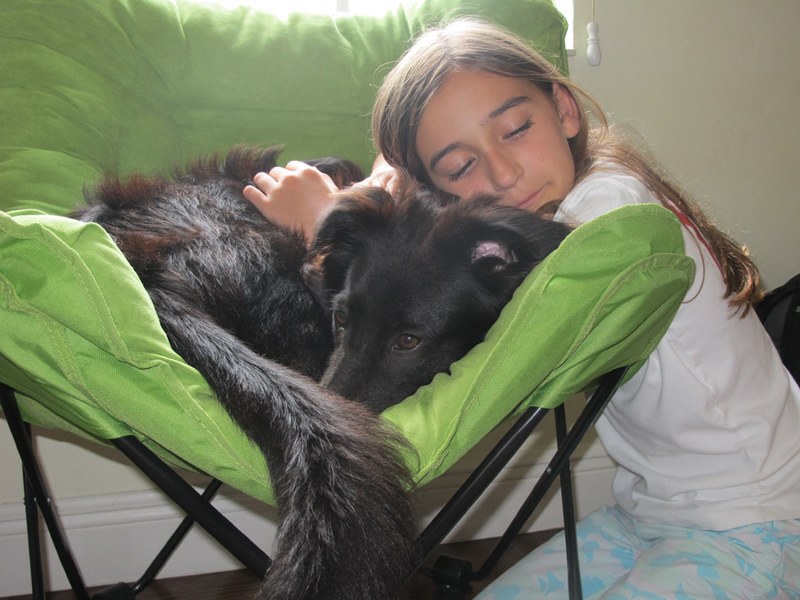 The loving bond between a girl and her dog really is priceless. I can’t wait to have my own TDL dog. Sophie, Your kindness and generosity are of someone well beyond your years. Don’t ever change! This is quite special, and left a lump in my throat and tears in my eyes also. It reminds me of why I am drawn to rescue. Not only to see the joy in the dogs but to experience the wonderful acts of kindness and heroism. That’s what makes rescue such a fulfilling experience. WOW Sophie, you rock. Animals can not speak for themselves. And now they do not have to because you care enough to speak for them. It is refreshing to see our younger generation taking time to care. Thanks for your selflessness. Sophie, what an incredible young woman you are! There are so, so, so many animals needing a helping hand. I feel better about the future of our world knowing that there are young people out there like you that will soon be adults. You have a very sweet and sensitive soul. Please don’t ever let the world change that.